Have you decided what you will bring to your family and friends soiree this holiday season? Cover the sliced shallots in flour, salt and pepper. Heat coconut oil to medium high and add the floured shallots. Fry for 3 minutes or until golden brown. Remove from stove and place on a plate lined with paper towels and place the onions on top but do not dab with paper towel. Drain cashews and reserve ½ cup of the water. Place cashews and water in a Vitamix or blender and blend until they are a creamy consistency, set aside. 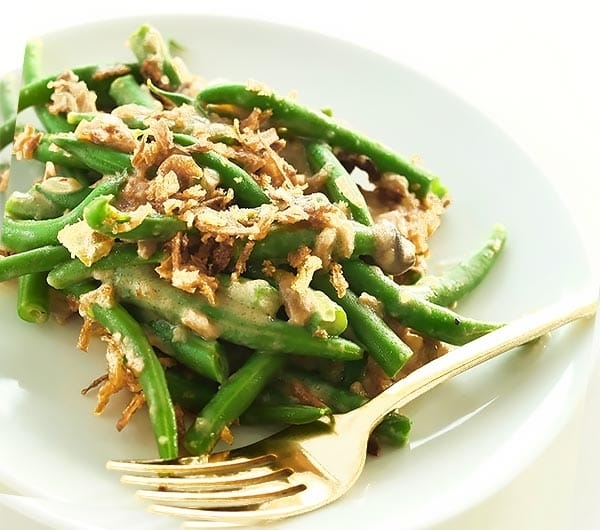 Bring 1 cup of water to boil and blanch the green beans for 3 minutes. Remove from boiling water and place in a 1 ½ quart baking dish. Bring the coconut oil to medium-high in a saucepan. Add mushrooms and cook for 2-3 minutes. Add garlic and continue for 1 minute. Turn off heat and add almond milk and cashew blend. Mix well and pour over the green beans in the baking dish. Bake for 15 minutes in the oven. Add Crunch topping and continue to bake 5 more minutes. Serve hot.